Correspondence: Associate Professor Joachim Sturmberg, PO Box 3010 , Wamberal, New South Wales , 2260, Australia. Background: Internationally, health care systems are struggling in an increasingly costly medical environment to satisfy population needs and demands. Narrow understandings of ‘health’ and ‘budgets’ dominate health system management and drive the reforms needed to adapt to the new challenges. Caught up in this unsustainable environment the general practitioner/family physician is challenged to operate effectively, while having lost his/her role definition. Key issues: The complexities of a ‘health care system’ are explained using a vortex model with the patient and his/her health at the centre. The somato-psycho-socio-semiotic paradigm assists the understanding of primary health care (PHC) as a multifaceted system constructed around patient and community care with the clinical encounter at its centre. Patients and their communities are linked in a multidimensional ‘health system’. 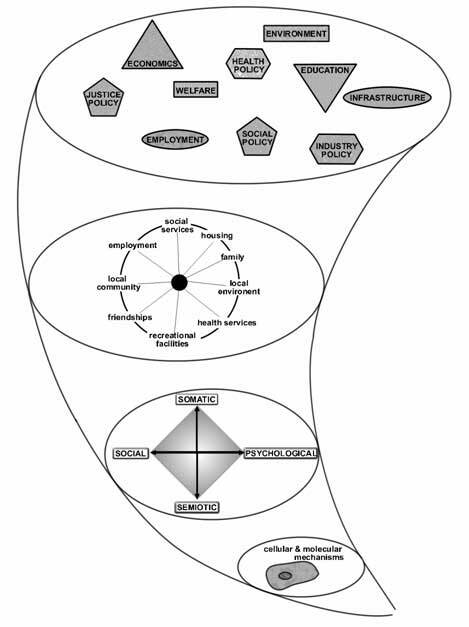 This includes other entities such as education, welfare, social justice systems, in addition to financial and tertiary-care type measurable disease features that traditionally define ‘health care effectiveness and efficiency’ This model depicts non-linear dynamic interdependencies and accountabilities within and among policies, the local environment, the clinical encounter and their cellular consequences. Practicing and teaching ‘patient-centred’ general practice care involves recognition of the social connectedness of the key actors – individual patients plus their practitioners, and the self-organizing capacity inherent in much of health care. The health system though is an interconnected, multilevelled, highly contextualized, dynamically adaptive social organization. During this period of continual reforms the role confusion experienced in general practice can be addressed with a deeper understanding of the nature of health, illness and disease and the socio-economic climate, so that all levels of providers are ultimately able to discharge their accountability to patients, communities and the population. Conclusion: In spite of the diverse range of challenges, general practice must promote a ‘change vision’ using a strategy that integrates and focuses on front-line providers. This has to meet patients’ individual needs at the point of care, despite economic and tertiary care disease model drivers. General practice is ultimately accountable to the patient, the community and the population to improve their health experiences with a realignment to a broader vision of health care. ‘Health care’ can be simplified by narrowly focusing on what doctors and allied health workers provide when confronted with patient diseases, or patient demands. On the other hand, ‘health care’ can be broadly seen as the complex societal activities in which health professionals engage in the interests of well and sick people. However, embracing the complexities inherent in ‘good health care’ requires both governments, industry and society at large, together with the health, education and welfare sectors to assess the impact of economic, employment, justice, education, health, environmental, capital works and other policies for their potential negative effect on our ‘health’ and ‘social capital’. Our analysis is based on the fundamental assumption that the focus of any health care system should be governed by its patients’ needs. Hence we embrace the complexities associated with planning and providing ‘patient-centred health care’ services. Metaphorically the complexities of the ‘health care system’ can be compared to a vortex. All the elements making up the ‘health care system’ exert their pressure onto the ‘health’ of the individual’s cells through their effects on the person’s environment and their effects on the balance of his somato-psycho-socio-semiotic needs (Fig. 2). Minor changes to a single element within the system can have major, and often unforeseen, consequences on the whole system. In the following section we describe how the disease-focused system maintains itself and how this affects primary care. Currently the system does not place ‘health’ at the centre of all considerations. The dominance of the ‘disease’ over the ‘illness’ model will perpetuate its own ‘disease-focused stability’, supported by the current mode of medical practice and teaching (Fig. 3). The disease approach largely ignores the forces exerted by the top of the vortex, that is, the context of the patient and societal structures, and uses as its starting point the cellular level. The illness approach, that is, the engagement with the patient recognizes the importance of cellular knowledge, but actively involves the knowledge exerted by the elements at the top of the vortex. Medical curricula have not changed in spite of evidence that firstly, most disease occurs in the community16 and secondly, 40–50% of all patients referred to specialist outpatient services have no organic disease found.12,13 Overall little attention is given to the study of the ‘sciences of illness’, that is, the context in which THIS patient’s illness occurs, issues of quality of life of the patient and his family, and the integration of the wider societal aspects on the patient’s life. Hence it is no surprise that large amounts of resources are wasted in unnecessary procedures while somatization as a cause of physical symptoms is largely ignored.17 In recent years the legal profession helped to perpetuate the disease emphasis by only accepting ‘hard data’, rather than clinical reasoning, as defensible evidence. •	changing health policy priorities through changing demographics and the pressures exerted by the other three issues (Fig. 4). Increasing economic inequality also decreases social cohesion, increases individual malaise, and produces the conditions by which increased mortality and morbidity occurs.24 The importance of social support in terms of reducing mortality and morbidity has been established.25 Social support is exerted through social networks, the quality of these relationships and the recourses they provide. Loss of social support is evidenced in measures like the rise of marital and family break-up, and the decline in participation of voluntary community institutions. •	case management around a financially based plan. In such a model, costs are determined as a result of the joint decision between the doctor and the patient as to what is the best action in THIS patient’s context. This approach requires time, but time is the most expensive resource in a throughput model. On the contrary, in a patient-centred outcome model time is the most cost-saving resource, eliminating unnecessary and unwanted interventions. Thus quality and efficiency of care are usually best understood at the point of service delivery, and they should drive the resource utilization in consultations rather than by the ‘top down’ constrained understandings of financial managers. Our populations will become older very rapidly in the early 21st century, with the proportionately largest increases in the population occurring at the oldest ages, that is 85 and above.32,33 We are also becoming more obese and prone to lifestyle-linked chronic disease epidemics. The reason for concern in the growing number of the aged is related to health care outlays which link back to the other issues. Older people cost more in terms of time requirements as well as in economic outlay; indeed half of all health care cost is spent on the last 6 months of a patients’ life. Often the health system delivers heroic attempts to save a life in an acute care setting with little attention to the patient’s experience and needs. General practice/family medicine has been placed at the forefront of the health care system, being charged with gatekeeping. 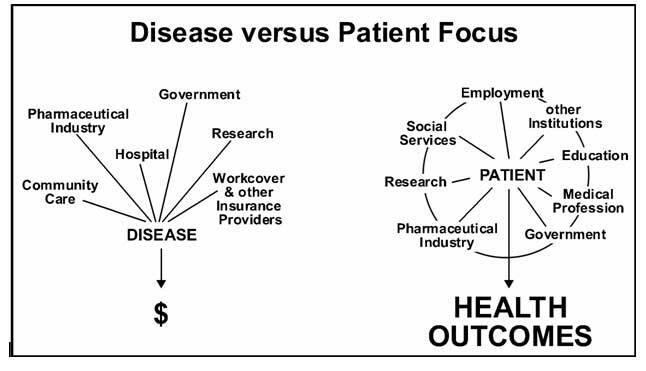 This can be interpreted as channelling patients into the most appropriate sector of the health care system, and/or limiting access and controlling cost within the health care system. Specialization of medicine according to disease and organ system entities has been spectacularly successful for a limited number of problems, resulting on the one hand in fragmented ‘health care’, and on the other it challenges the need for general practice/primary care services. Research within the tertiary medical environment has identified numerous risk factors associated with its disease spectrum. Risk factors are now seen as ‘diseases’ resulting not only in an explosion in the number of ‘non-disease’ entities34 but also leading to a ferocious effort of screening and treatment despite the fact that there is little evidence for improvement of clinically relevant outcomes in those affected.18 This preoccupation with ‘case finding’ undermines attention being paid to behavioral approaches to healthy living and the modification of high-risk attitudes and behaviors. Health in the current climate is narrowly defined through economic and health service considerations, rather than the experience of the patient. Factors perpetuating this approach are linked through the dominance of economic concerns and tertiary level medicine and the medical education framework. This model is unsustainable – new medical developments, often implemented uncritically, exacerbate cost pressures and typically drain resources from other social portfolios. The general practitioner/family physician is squeezed within this system, having difficulties to operate effectively in response to unrealistic demands and loss of role definition. A new vision and conceptual framework based on complex adaptive systems and the somato-psycho-socio-semiotic paradigm is required to address these issues on a real basis. Considerable self-organizing as a bottom-up dynamic must be generated through interactive bonding among key individuals who are stakeholders at each layer of the primary care system, but particularly at the level of care delivery. In spite of economic and the wide range of other diverse challenges, general practice/family medicine must promote a ‘change vision’ and strategy to integrate and focus on front-line providers and meeting patients’ individual needs at the point of care, despite economic and tertiary care disease model drivers. General practice/family medicine is ultimately accountable to the patient, the community and the population to improve their health experiences with a realignment to a broader vision of health care. 1	Popper K. Conjectures and Refutations: the Growth of Scientific Knowledge. London: Routledge and Kegan Paul, 1972. 2	Senate Community Affairs References Committee. First report – Public hospital funding and options for reform. Canberra. Available at: http://www.aph.gov.au/senate/committee/clac_ctte/completed_inquiries/1999–02/phealth_first/report/report.pdf 2000. 3	Rosenberg C. The Tyranny of Diagnosis. Specific Entities and Individual Experience. Milbank Q 2002; 80: 237–60. 4	Glouberman S, Zimmerman B. Complicated and Complex Systems: What Would Successful Reform of Medicare Look Like? : Discussion Paper No. 8. Commission on the Future of Health Care in Canada, Otawa, 2002. 5	Pauli H, White K, McWhinney I. Medical Education, Research, and Scientific Thinking in the 21st Century (Part one of three). Educ Health 2000; 13: 15–25. 6	Fugelli P. Trust. Gen Pract 2001; 51: 575–9. 7	Sturmberg JP. The Foundations of Primary Care. Daring to be Different. London: Radcliffe Publishing, 2007. 8	Capra F. The Web of Life. London: HarperCollins Publishers 1996. 9	McDaniel Rj. Strategic Leadership. A View from Quantum and Chaos Theories. Health Care Manage Rev 1997; 22: 21–37. 10	Beckman H, Frankel R. The Effect of Physician Behavior on the Collection of Data. Ann Intern Med 1984; 101: 692–6. 11	Martin C, Banwell C, Broom D, Nisa M. Consultation length and chronic illness care in general practice: a qualitative study. Med J Aust 1999; 171: 77–81. 12	Gottlieb E. The great x-ray mystery. J Pract Orthodon 1969; 3: 486–93. 13	Speckens A, van Hemert A, Spinhoven P, Hawton K, Bolk J, Rooijmans H. Cognitive behavioural therapy for medically unexplained physical symptoms: a randomised controlled trial. Br Med J 1995; 311: 1328–32. 14	Kiecolt-Glaser J, McGuire L, Robles T, Glaser R. Psychoneuroimmunology. Psychological Influences on Immune Function and Health. J Consult Clin Psychol 2002; 70: 537–47. 15	Cox K. Who’s My Doctor Today? Educ Health 2002; 15: 370–5. 16	White K, Williams F, Greenberg B. The Ecology of Medical Care. N Engl J Med 1961; 265: 885–92. 17	Mayou R, Sharpe M. Treating medically unexplained physical symptoms. Br Med J 1997; 315: 561–2. 18	Fisher E, Welch H. Avoiding the Unintended Consequences of Growth in Medical Care. Hwo Might More Be Worse? J Am Med Assoc 1999; 281: 446–53. 19	Nielsen M, Thomsen J, Primdahl S, Dyreborg U, Andersen J. Breast cancer and atypia among young and middle-aged women: a study of 110 medicolegal autopsies. Br J Cancer 1987; 56: 814–9. 20	Harach H, Franssila K, Wasenius V. Occult papillary carcinoma of the thyroid. A ‘normal’ finding in Finland. A systematic autopsy study. Cancer 1985; 56: 531–8. 21	Montie J, Wood DJ, Pontes J, Boyett J, Levin H. Adenocarcinoma of the prostate in cystoprostatectomy specimens removed for bladder cancer. Cancer 1989; 63: 381–5. 22	Whitehead M. Diffusion of Ideas on Social Inequalities in Health: a European Perspective. Milbank Q 1998; 76: 469–92. 23	Subramanian S, Belli P, Kawachi I. 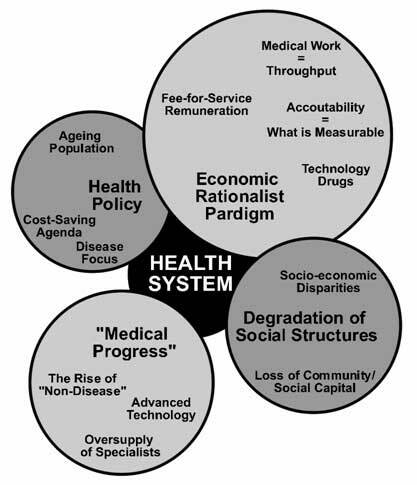 Macroeconomic Determinants of Health. Annu Rev Public Health 2002; 23: 287–302. 24	Wilkinson R. Unhealthy Societies: the Afflictions of Inequality. London: Routledge 1996. 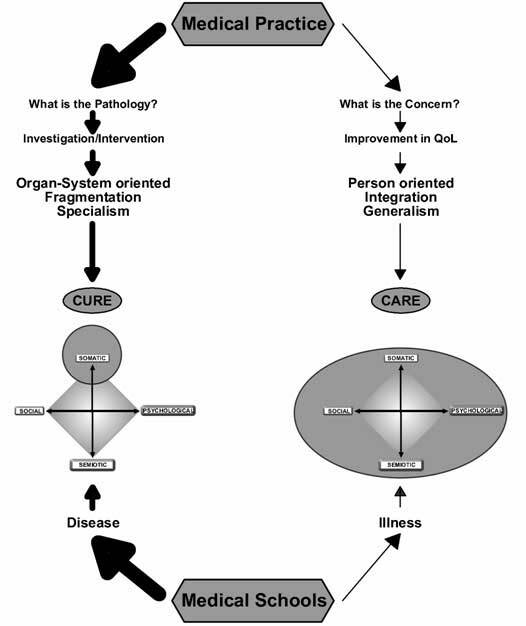 25	Cohen S. Psychosocial models of the role of social support in the etiology of physical disease. Health Psychol 1988; 53: 1066–74. 26	Gosden T, Forland F, Kristiansen I, et al. Capitation, salary, fee-for-service and mixed systems of payment: effects on the behaviour of primary care physicians. The Cochrane Library 2004 (Issue 4). 27	Bodenheimer T. The HMO Backlash – Righteous or Reactionary? N Engl J M 1996; 335: 1601–4. 28	Hart J. What evidence do we need for evidence based medicine? J Epidemiol Community Health 1997; 51: 623–9. 29	Cochrane A. Effectiveness and efficiency. Random reflections on health services. London: The Nuffield Provincial Hospitals Trust, 1972. 30	Moynihan R, Heath I, Henry D. Selling sickness: the pharmaceutical industry and disease mongering. Br Med J 2002; 324: 886–91. 31	Martin C, Attewell R, Nisa M. Chronic care in adulthood and old age: physical and psychosocial management in general practice encounters. Aust J Prim Health Care 2000; 6: 57–67. 32	Hogan S, Hogan S. How Will the Ageing of the Population Affect Health Care Needs and Costs in the Foreseeable Future? Available at: http://collection.nlc-bnc.ca/100/200/301/pco-bcp/commissions-ef/future_health_care-ef/discussion_paper-e/no25/25_e.pdf Commission of the Future of Healthcare in Canada, 2002. 34	Meador C. The Art and Science of Nondisease. N Engl J Med 1965; 272: 92–5. 35	McWhinney I. Family Medicine in Perspective. N Engl J Med 1975; 293: 176–81. 36	Starfield B. Primary Care. Balancing Health Needs, Services, and Technology. Revised edn. Oxford: Oxford University Press, 1998. 37	Schlesinger M, Mechanic D. Challenges for managed competition from chronic illness. Health Affairs (Millwood) 1993, 2000; 12: 123–37. 38	Primary Care and Health: 21st Century Challenges to Quality. The General Practice Evaluation Program. The 2000 General Practice Evaluation Program Conference Proceedings, September 2000, Adelaide, Australia. Adelaide: National Information Service, Department of General Practice, Flinders University, 2000. 39	Lauritzen T, Mainz J, Lassen J. From science to everyday clinical practice. Need for systematic evaluation of research findings. Scand J Prim Health Care 1999; 17: 6–10.